Worms (ワームス) is a turn based strategy game developed by Team 17, and was originally published by Ocean Software for the Amiga in 1995. 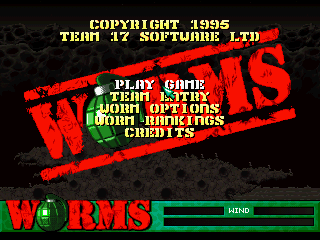 It is the first in a long-running series of Worms games, and was ported to a variety of platforms, including the Sega Mega Drive and Sega Saturn. The game involves the player controlling a team of worms supplied with a variety of different weapons, with the aim is to eliminate all the enemy worms on a 2D playfield. Worms was revolutionary at the time due to its use of randomly generated and fully destructible landscapes; an explosion for example will leave a round crater, thus limiting the area worms can stand on and potentially creating the need for a different strategy. As a turn-based game, the game allows up to 16 players to take control of units (though there is only ever a maximum of four teams). While the gameplay is largely the same between the Mega Drive and Saturn versions of Worms, the Saturn version benefits from a number of graphical upgrades and an in-game soundtrack.